It is in response to a letter to the editor by Euan Hague, a professor there, that Thomas Woods was a neo-Confederate. Euan Hague's letter unfortunately is no longer online. I printed out copies of both letters from my records. 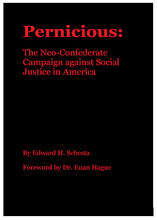 Thomas E. Woods has a website http://www.thomasewoods.com/ which omits in his resume his articles in Southern Partisan and elsewhere in the Neo-Confederate movement. In his biography, in the lengthy list of periodicals he has contributed to he omits Southern Partisan. His helping to found the League of the South http://leagueofthesouth.net/index.php and his activities in the League of the South is omitted. Well, I am rather busy now, but I do definitely plan to do a Thomas E. Woods web page and include a bibliography of many of his articles that he has omitted from his web page. I am curious if he is the same Tom Woods who at Harvard authored an article in Penisula attacking Carol Moseley-Braun for her blocking the renewal of the United Daughters of the Confederacy patent and had his article reprinted in the United Daughters of the Confederacy Magazine.